Published by and exclusively available at Catch Budapest! Buy ebook and download now! Discover Budapest from its most authentic and honest side with us. Unlike regular travel-guide authors, we’re long-term locals and lovers of Budapest. We want to show YOU Budapest just like we show it to our best friends. Our city is our passion and so is our guidebook. It’s a genuine project of our hearts and so much more than just a quick “overview” of the Hungarian capital. Over the last years, we’ve seen the changes Budapest has undergone from the front row. We’ve seen the tourist waves getting bigger and bigger with each year, “hotspots” rise and fall, the mindset of the locals changing and Budapest constantly opening up, becoming this booming, vibrant and colourful city it is today. Today, Budapest is often mischaracterized as a mere party city with only cheap booze. Most visitors never make it past that image because they get caught up in the tourist / backpacker / expat bubble and, in doing so, miss out on so many more things the city has to offer. This is the book where we share all of our knowledge about what Budapest truly has to offer – it’s most authentic spots and experiences. This guidebook will help you peel back the multiple layers of Budapest one by one. It’ll help you see Budapest the way it’s meant to be seen. We’ve also included day trips and walking routes for perfect days full of new discoveries and created a directory and a map for those moments in which you just need quick info. Unlike usual tourist guides, this book will open-heartedly encourage you to experience Budapest as if you’d lived here for years. It is a declaration of unconditional love for a city that is constantly evolving, has a thousand faces and never fails to delight and entertain. Throughout its 99 chapters, this book will reveal more than 200 places, sights and activities in Budapest to you that will each teach you something new about the city or simply entertain. Numerous Secret Cafés, Bars, Restaurants and (Ruin-) Pubs for your day- and nightlife – as no day is complete without good food and drinks! Unique Panoramas – See the city from a different viewpoint! Hidden Neighbourhoods and Communities – Ever heard of Budapest’s “Forbidden City”? Little Under-the-Radar Shops and Flea Markets – Get hold of affordable designer stuff or old books, vintage clothes and even furniture! Scenic Public Transportation Rides – Metros, tramways and even a boat! The Best Live Music Venues – Listen to Hungarian or international (indie-) bands and Sing along to the Lyrics! Plenty of Ideas for Rainy and Cold Days – As there are no “bad days” in Budapest! Apart from the 99 chapters (with more than 200 places) we have included a directory and an online map in order to help you find what you need right now, according to your situation, mood or even the weather. Julia Horvath (simply known as Juli) is the co-founder of Catch Budapest. She was born in Budapest where she spent half of her life. Apart from that she lived in Germany and Austria, travelled in almost 50 countries, studied business and economics and has worked for various multinational companies. 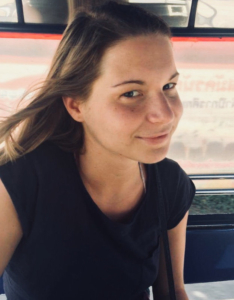 In the end it came down to devoting her time to what she loves the most: Exploring, discovering and getting deep under the surface of her surroundings as well as helping people to make the most of their time in her hometown Budapest. Her articles and neighborhood guides were featured in Budapest’s online magazines Expat Press and XPatLoop. As local travel crusaders we dig this eBook! Filled with truly local tips to experience Budapest like a local! 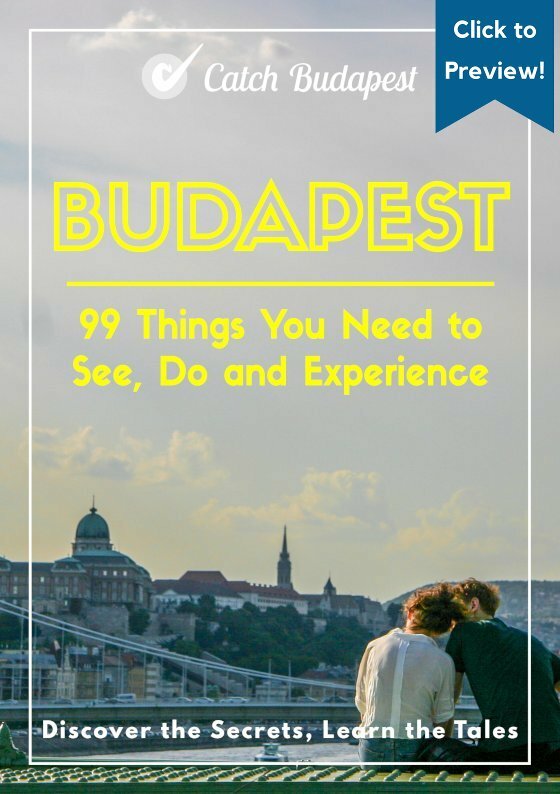 Budapest– 99 things you need to see, do and experience, is a fascinating guide to Hungary’s famed capital city. This is not your average tourist tome, it was written by locals who have researched their subject matter extensively and found a wealth of gems, many of which I was not aware of, even after living in Budapest for more than 20 years. If I were to advise one guide for visitors to Budapest, it would be this one. Altough I work as a tour guide in Budapest, still I found some new and interesting spots in Catch Budapest’s ebook. I can highly recommend to buy this well written and unique guide of the city. What makes this Budapest guidebook different? This is no “one-size-fits-all”-guide. It caters to conscious travellers and locals who want to make the most of their time in Budapest by discovering its offbeat corners and secret places through these 99 chapters. What makes you an expert on Budapest? Budapest is our home. While travelling and moving around a lot, Juli spent more than ten years of her life in Budapest while Flo has lived here for more than a year. Juli knows the city like the back of her hand and watched it change, evolve and develop throughout the years. How did you pick the places that you recommend? Rather than just showing you the coolest, hippest and the newest, we focussed on places that are worth your time and will genuinely teach or reveal you something new about Budapest. It’s often the story behind that makes a place really interesting and special and these stories are what really fuel our discoveries. And keep in mind that we never ever accept payment or any other favours for content. What’s the difference between this guide and all the information on this site? While this site has a lot of information about Budapest as well it doesn’t even come close to all the content and hidden gems you’ll find in the book. Starting from scenic walking routes and day trips over secret bars, cafés, buildings and architectural masterpieces but also unique panoramas, historically relevant places, concealed inner courtyards and so much more – this book goes far more into detail than any blog post possibly ever could. No, it’s only available as an ebook (pdf). Yes. As safe as it can be online. Gumroad is a 100% secure site, and we will not have any of your credit card or Paypal information. Once you pay, Gumroad will send you an email with a download link. Once you’ve downloaded it to your computer, it’s yours! For European citizens VAT applies, which you’ll see when you check out. How can I contact you if I have any questions regarding the book? You can always drop an email to catchbudapest [at] g m a i l.com or use our contact form here. We answer every single email personally.